50 Years Ago in Hockey: 60 Goals for Golden Jet? Bobby Hull, hockey’s Golden Jet, is off to such a fast start in this fledgling National Hockey League season that speculation has already begun about how many goals the explosive Chicago Black Hawks winger will score over the next 67 games. Hull scored two more as the Black Hawks soared to their third straight win by a 5-1 score over the Detroit Red Wings in the only NHL game played last night . Hull now has six goals in Chicago’s first three games. It’s not a stretch to start thinking that a total of say, 60 goals, could be the new NHL standard come April. Last season, Hull seemed to be well on his way to cracking the 50-goal plateau, the NHL record he shares with Bernie (Boom Boom) Geoffrion and Maurice (Rocket) Richard. He had 32 goals by midseason but was sidelined by a knee injury. That caused him to finish with 39 for the year. If Hull can stay healthy, he has every chance to surpass the magic number of 50. In last night’s game at the Olympia in Detroit, Hull and Doug Mohns, another Hawk off to a fast start, each potted a pair. Big Phil Esposito, Hull’s centreman, was the other Chicago goal getter. Alex Delvecchio was the lone Red Wing to beat Chicago netminder Glenn Hall. His marker came in the third period, but by that time, the issue was no longer in doubt. Detroit had the edge in play during the opening frame, outshooting Chicago 13-7, but that’s when Hall did his best work. 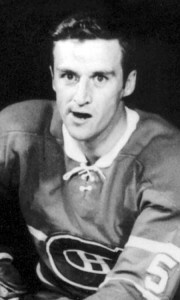 Esposito’s goal, just five seconds before Wings’ defender Bob McCord was to return to the ice from the penalty box, was the only scoring play in the opening 20 minutes. Chicago had both goals of the middle stanza, with Mohns and Hull netting one each when Chicago began to take over the play in that period. Detroit made a bit of a come back in the final period but except for Delvecchio, they were unable to find a chink in Hall’s armour. Two games were played in the OHA Junior A Series last night. The Montreal Junior Canadiens got past the Hamilton Red Wings 6-4 while the Peterborough Petes took a 7-4 decision from the St. Catharines Black Hawks. At Hamilton, the Baby Habs scored a pair of power play goals in the third period to pull away from the Red Wings. Lucien Grenier and Chris Bordeleau led the way for Montreal with two goals apiece. Michel Lapalme and Larry Pleau added singles. Sandy Snow, Brian Watts, Ed Hatoum and Gary Marsh replied for the Red Wings. Peterborough native Mickey Redmond fired a pair of markers for the Petes in their home-ice win over St. Catharines. Dale McLeish, Andre Lacroix, Joey Johnston, Paul Curtis and Guy Dufour also connected for the Petes. 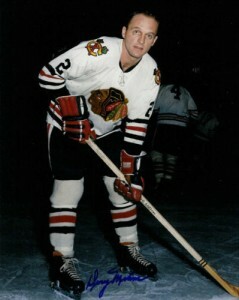 Black Hawks goals came from Bob Sicinski, Jim Stanfield, Kerry Bond and Kenny Laidlaw. Boston Bruins have called up goalie Bob Ring from the Niagara Falls Flyers of the OHA Junior A Series. He will back up Ed Johnston while rookie Gerry Cheevers recovers from a knee injury suffered in Wednesday’s game against Toronto. Boston also sent forward/defenseman Paul Popiel to Hershey of the AHL. Camille Henry, who had serious back surgery during the summer, has been given the green light by Chicago Black Hawks doctors to begin skating. Henry hopes that if all goes well, he will be back in the Hawks’ lineup in a month. Chicago general manager Tommy Ivan says that goalie Denis DeJordy asked to be sent to St. Louis of the CPHL so that he could play regularly. Glenn Hall is not about to be supplanted as the regular in the Windy City. 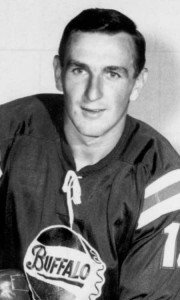 Former Maple Leaf Ron Stewart, traded to the Bruins in the offseason, has scored two goals so far – the same total the entire Leaf team has managed in three games thus far.